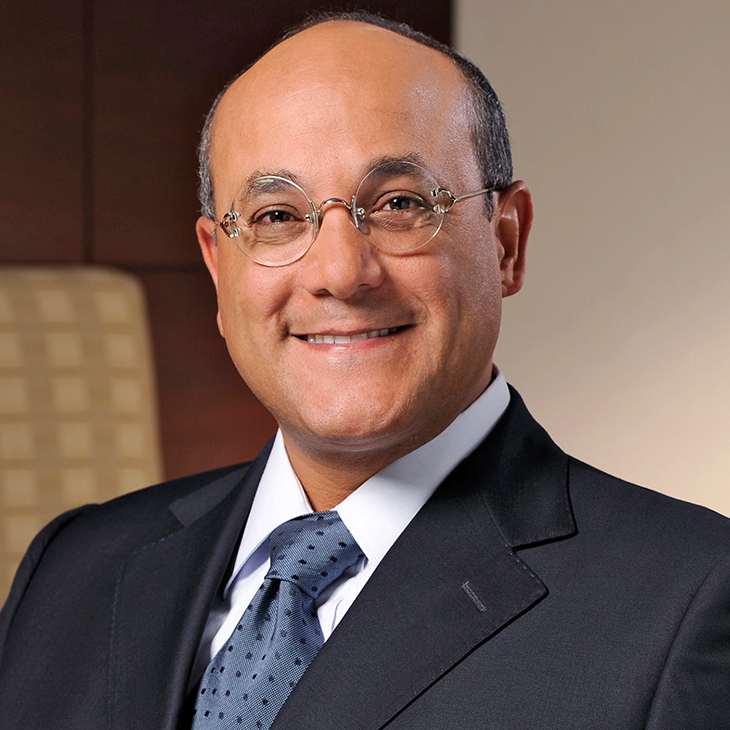 Yasser El-Gamal’s practice focuses on technology and related regulatory issues including patent, trademark, trade secret, copyright, and FDA regulatory matters. He has multiple technical degrees and years of practical industry experience, is a registered patent attorney with a record of service spanning more than 20 years, is regularly sought and quoted by leading publications, and is consistently recognized as one of the top attorneys in his field. He has particular experience in areas such as consumer electronics and accessories, enterprise electronics and computing, healthcare and life sciences, health-tech, Internet, optical communications, LEDs, nanotechnology, sporting equipment, and software. His clients range from innovator startups to established Fortune 500 companies. Yasser regularly litigates complex IP matters in federal courts nationwide and appears in administrative proceedings before the U.S. International Trade Commission; in contested proceedings, such as IPRs, before the U.S. Patent and Trademark Office (USPTO); and in alternative dispute resolution proceedings. In 2009–2010, he served as a prosecutor at the Anaheim City Attorney’s office, where he tried criminal cases. Apart from litigation, Yasser regularly advises clients on issues of strategic IP portfolio management, technology transfer (licensing and acquisition), due diligence, valuation, product development (including clean-room development), monetization, and regulatory approval and compliance issues. He also prosecutes a substantial number of patent and trademark applications before the USPTO, and oversees such matters in foreign countries and before regional authorities. His background as a former U.S. patent examiner, coupled with his technology, industry, litigation, and regulatory experience has made him a highly valued resource to clients and others in the practice. Provided strategic intellectual property counseling to this early-stage medical device company focused on minimally invasive beating heart tissue valve replacement. Provided IP counseling regarding the company’s Guitar Hero™ product line. Provided intellectual property counseling regarding treatment for hepatitis C to the research foundation, which is focused on development of therapies for widespread endemic diseases. Provided intellectual property counseling regarding patent rights relating to automotive technology and competitor IP landscape. Memory Control Enterprises, Inc. v. American Honda Motor Co., Inc. et al. Represented defendant Honda in a patent infringement suit relating to 3D imaging for thick and thin computer clients. The case settled. Case No. 07cv4903 (U.S.D.C. N.D. Ill. 2007). Orion IP, LLC v. American Honda Motor, Inc., et al. Represented Honda in a patent infringement suit relating to computer-assisted systems and methods. The case settled in 2006. Provided intellectual property counseling regarding patent rights relating to automobile technology. Case No. 2:03-cv-313 LED (U.S.D.C. E.D. Tex. 2005). Avocent Redmond Corp. v. Belkin International, Inc. et al. Represented Belkin in a four-patent litigation relating to computer interconnection systems. Case No. 2:12-cv-01342-RSM (W.D. Wash. 2012). Meltzner Innovations, LLC v. Belkin International, Inc. Represented Belkin in a patent litigation relating to power switches. Case No. CIV-12-638-C (W.D. Okla. 2012). Avocent Redmond Corp. v. Rose Electronics, et al. Was requested to take over from prior counsel representation of Belkin, Inc., and Belkin International, Inc., defendants in a three-patent litigation relating to switching technology with on-screen display functionality. Case No. C06-1711RSL (W.D. Wash. 2006). Aerielle v. Belkin International, Inc., et al. Represented defendants Belkin, Best Buy and RadioShack in a two-patent litigation relating to FM transmitters. Case No. 3:10-cv1301 (N.D. Cal. 2010). Aten International Co., Ltd. and Aten Technology, Inc. v. Emine Technology Co., Ltd. et al. Represented Belkin in a patent infringement action relating to electronic switching devices. Case No. SACV 09-0834-AG (C.D. Cal. 2009). Clear With Computers, LLC v. Belkin, et al. Represented Belkin as a defendant. The case settled. Case No. 6:08-cv188 LED (E.D. Tex. 2008). Aten International Co., Ltd. and Aten Technology, Inc. v. Emine Technology Co., Ltd. et al. Represented Belkin in patent infringement action relating to electronic switching devices for USB interfaces. Case No. 2:08:cv-253 DF (E.D. Tex. 2008). Certain Switches and Products Containing Same. Successfully represented Belkin in a patent infringement investigation relating to keyboard, mouse and video (KVM) switches. Following extensive fact and expert discovery, a five-day hearing and a post-hearing briefing, the ITC ruled that none of the accused Belkin products infringed and that to the extent the patent was construed broadly as the complainant asserted for purposes of infringement, the patent would be invalid over the prior art including complainant’s own prior art devices. Complainants chose not to appeal the ruling. ITC Inv. No. 337-TA-589 (Int’l Trade Comm’n 2006). Aten International Co., Ltd. v. Belkin Corporation et al. Represented Belkin in a patent infringement action relating to KVM switches. Case No. 2:06:cv-296 LED (E.D. Tex. 2006). Bird Barrier America, Inc. v. Bird-B-Gone, Inc., et al. Represented plaintiff Bird Barrier in a multi-action lawsuit for patent infringement, pre-issuance damages (provisional rights), false designation of origin, trade dress infringement and unfair competition under Cal. Bus. Code §§ 17,200 et seq. Case No. SACV 09-0418 AG (MLGx) (C.D. Cal. 2009). Bird-B-Gone, Inc. v. Barrier America, Inc., et al. Representing defendant Bird Barrier in a patent infringement action relating to bird repellent structures. Case No. SACV 09-01185 DOC (MLGx) (C.D. Cal. 2009). Represented Bridgestone and related companies in negotiating and documenting a patent license agreement. Provided intellectual property counseling regarding patent, trademark, copyrights and counterfeiting issues. Representing company in IP strategic analysis and acquisitions and litigation matters. CardioGenesis Corporation v. PLC Medical Systems, Inc. Represented startup CardioGenesis in a patent infringement action involving heart-synchronized pulsed laser systems. Case No. 96-20749 SW (N.D. Cal. 1996). Provided intellectual property counseling regarding policyarchive.org website and copyright safe harbor provisions. Provided intellectual property counseling regarding indemnification issues. Product Association Technologies LLC v. Clique Media Group. Represented defendant Clique in a patent infringement case involving Internet sales systems and disseminating product information via the Internet using universal product codes. Invalidated patent on motion to dismiss. Case No. 2017-cv-05463 (CACD 2017). Product Association Technologies LLC v. Clique Brands Inc. Represented defendant Clique on patent appeal to Court of Appeals for the Federal Circuit in a patent infringement case involving Internet sales systems and disseminating product information via the Internet using universal product codes. Appellate court affirmed trial court’s judgment invalidating patent in favor of Clique. Case No. 18-1090 (CAFC 2018). Provided intellectual property counseling regarding imaging technology. Core Optical Technologies, LLC v. Fujitsu Network Communications, Inc. Represented plaintiff Core Optical in a patent infringement action involving optical communications. Case No. 8:16-CV-00437-AG-JPR (C.D. Cal. 2015). Core Optical Technologies, LLC v. Infinera Corp. Representing plaintiff Core Optical in a patent infringement action involving optical communications. Case No. 8:17-CV-00548-AG-JPR (C.D. Cal. 2017). Represented patent owner Core Optical Technologies, LLC, in Inter Partes Review. In each case the U.S. Patent and Trademark Office ruled in favor of the patent owner and denied institution of the IPR petitions. Case Nos. IPR2016-01618 and IPR2018-01259. Global Communications Inc. v. DIRECTV, Inc. Represented defendant DIRECTV in a patent infringement action involving direct broadcast satellite antennas and LNB circuitry. Case settled. Case No. 4:04-CV60-SPM/AK (N.D. Fla.). Forgent Network, Inc. v. Echostar, et al. Represented defendant DIRECTV in a patent infringement action involving set-top boxes. Case No. 2-05cv-318 LED (E.D. Tex. 2005). Superguide Corporation v. DIRECTV Enterprises, Inc., et al. Represented DIRECTV in a patent infringement action involving electronic television program guides. Civil Action No. 1:00 CV 144-T (W.D. N.C.). Provided intellectual property counseling regarding oxymeter technology. Dongtai Huawei Standard Component Corp.
Penn Engineering & Manufacturing Corp. et al. v. Shanghai Jingyang Import & Export Co., Ltd., et al. Represented Dongtai in a patent and trademark infringement suit directed to fasteners. Case No. 2:07-Cv-01505-Pmp-Gwf (U.S.D.C. Nev. 2007). Provided intellectual property counseling regarding patent rights for sporting goods. Ecology Control Industries, Inc. v. West Coast Storm, Inc., et al. Represented plaintiff ECI in an action for patent infringement relating to automatic retractable drain systems and unfair competition claims. Case No. 09-435 PA (PLAx). Provided intellectual property counseling regarding LED technology and licensing agreements. Ronald A. Katz Technology Licensing, L.P. v. TD Banknorth LLC, et al. / In re Katz Interactive Call Processing Patent Litigation. Represented Experian in a patent infringement suit relating to call processing technology. Case Nos. 1:06-CV-00544-GMS (U.S.D.C. Del. 2006) and (U.S.D.C. C.D. Cal. 2007) / Case No. 2:07 ML-01816-RGK-FFMx. Provided intellectual property counseling to startup regarding patent rights for disposable cameras. Provided intellectual property counseling to startup regarding patent rights for electrochemical bio and chemical sensors. Provided intellectual property counseling regarding patent rights for biotechnology. Vehar, et al. (Genentech) v. Toole, Jr. (Genetics Institute/Wyeth). Represented party Vehar, et al. (Genentech), in an interference before the Board of Patent Appeals and Interferences of the U.S. Patent and Trademark Office regarding patent rights to B-domain deleted human Factor VIII:C. Interference No. 103,215.
Genentech, Inc. v. Wyeth. Represented Genentech, Inc., in an inventorship priority contest regarding patent rights to B-domain deleted human Factor VIII:C. Case No. 03-1160-GMS (D. Del). Provided intellectual property counseling regarding trademark and copyright matters. Provided intellectual property counseling regarding patent, trademark, copyrights and counterfeiting issues. Representing company in IP strategic analysis and in acquisitions and litigation matters. Diane Funk v. Indio Chamber of Commerce, et al. Represented the Indio (California) Chamber of Commerce in two contested matters relating to its registered service mark and trademark for The Southwest Arts Festival. Case settled in 2006 on favorable terms, with the Indio Chamber successfully retaining full ownership of both marks. Case No. INC 024089 (Cal. Super. Ct., Riverside County) and Trademark Trial and Appeal Board (Cancellation No. 92040524). Provided intellectual property counseling regarding trademark and patent rights for light-emitting diode lighting products. Provided intellectual property counseling regarding trademark and patent rights and trade secret enforcement for flashlights. Meggitt San Juan Capistrano, Inc.
Meggitt San Juan Capistrano Inc. v. Nie Yongzhong et al. Represented plaintiff Meggitt in a trade secret misappropriation action against Chinese entity. Obtained a six-figure sanctions award against the defendants for discovery abuses, including dismissal of the defendants’ key affirmative defense, which led to favorable settlement terms. Case settled. Case No. 8:13-CV-00239-DOC-DFM (C.D. Cal. 2013). Provided intellectual property counseling regarding patent rights for nanotechnology directed to modular microfluidic devices. Provided intellectual property counseling regarding patent rights for injection-molded wine dispensing valves. Aristo Medical Products, Inc. v. Datex-Ohmedia, Inc. Represented Aristo Medical in a patent infringement suit directed to oxymeter probes. Case No. CV-00-03047-FMC (C.D. Cal.). Provided intellectual property counseling regarding patent rights for camera control and positioning. Detweiler et al. (NCR Corp.) v. Bobba et al. (PSC Scanning, Inc.). Represented PSC in an interference before the Board of Patent Appeals and Interferences of the U.S. Patent and Trademark Office regarding patent rights to five-sided bar code scanners. Interference No. 104,631. Quarton, Inc. v. Ideavillage Products Corp. et al. Represented Quarton in a patent lawsuit relating to laser-implemented measurement. Case No. 06cv3986 (N.J. 2006). R.A. Phillips Industries, Inc. v. Spartan Marketing Services, Inc. and NAFTA Warehousing Services, Inc. Represented R.A. Phillips in arbitration regarding a dispute arising from the termination of a long-term Canadian distributor. Initially obtained preliminary relief from the Canadian tribunal ordering the distributor to return detained goods, and obtained summary judgment dismissing the distributor’s claim for one year of commissions following termination date. (Superior Court of Justice, Ontario, Canada, and the International Center for Dispute Resolution, 2006). Provided intellectual property counseling regarding memory device applications and joint ventures. Ranger Security Detectors Inc. v. Rapiscan Security Products, Inc. et al. Represented Rapiscan in a patent infringement suit relating to metal detection systems. Case No. EP05CA0385 (W.D. Tex. 2005). Good Technology, Inc. v. Research In Motion, LTD. Represented RIM in an action brought for declaratory judgment of noninfringement of RIM patent on wireless email communications technology. Case No. C02-02348 (N.D. Cal. 2002). Diagnostics Systems Corporation v. Oracle Corporation, et al. Represented SAS in a patent infringement action relating to database management. SA CV 07-960 DOC (ANx) (C.D. Cal. 2007). Represented patent owner Scuf/Ironburg in multiple IPR proceedings, successfully defeating allegations of invalidity of patents (2017–2019). Steven Jiles v. Southern California Gas Company, et al. Represented Southern California Gas Company in a patent inventorship dispute directed to earthquake-proof gas valves. Case No. CV-99-00520-TJH (C.D. Cal.). SP Systems LLC v. Ledgent Search Group, Roth Staffing Companies, Inc., Ultimate Staffing Services, LP. Represented SP Systems in a contract dispute regarding failure to perform appropriate due diligence in connection with an employee placement. Case No. BC 371494 (Super. Ct. Cal. 2007). Provided intellectual property counseling regarding automobile tire technology. Provided intellectual property counseling to startup Stomp, Inc., regarding trademark and patent rights for adhesive labeling devices for optical discs. Neato, LLC v. Stomp, Inc. Represented Stomp in a patent infringement suit directed to adhesive label applicators for use in labeling optical discs. Case No. 398 CV01746 (AVC) (D. Conn.). Provided intellectual property counseling regarding various patent and trademark matters. Provided intellectual property counseling regarding wireless communication technology and polling. Optimum Power Solutions, LLC v. Toshiba America Information Systems, Inc. Represented Toshiba and provided intellectual property counseling regarding dynamic power management of solid state memories for computing devices. Case No. 8-11-cv-01460-AG-AN (C.D. Cal. 2011). Provided intellectual property counseling to startup X.com regarding website graphical user interface technology. Speaker, “Post Grant Patent Review Proceedings — Statistics and Strategy,” North Carolina Bar Association Annual Meeting, March 21, 2014. Speaker, “Innovation Act: Get Ready for Changes in Patent Litigation and Contested Post-Grant Review Proceedings,” Association of Corporate Counsel Southern California — Orange County Roundtable, February 26, 2014. Speaker, “The New Battlefield: Patent Proceedings Under the America Invents Act,” Patent and In-House Counsel Interest Groups Webinar, January 24, 2014. Speaker, “The New Battlefield: One Year Review of Post-Grant Patent Review Under the America Invents Act,” AIPLA Webinar, October 9, 2013. Coauthor, “The New Battlefield: One Year of Inter Partes Review Under the America Invents Act,” AIPLA Quarterly Journal, Winter 2014. Coauthor, “The Discoverability Of Patent License Negotiations,” IP Law360, April 20, 2010. Coauthor, “Method Madness,” Los Angeles Lawyer, Vol. 23, No. 7, October 2000, reprinted in The Computer & Internet Lawyer, Vol. 18, No. 2, February 2001.